EXQUISITE! LIMITED EDITION SALVADOR DALI SIGNED PRINT, Own it! This is the VERY RARE Stunningly exciting Surreal and Sensuous Love Print, by one of the worlds most intriguing and dynamic artists of all time. Own one of his most sought after rare works. This piece is extremely difficult to find! Limited availability only a few left. This is a rare Authentic Limited Edition Giclee, Signed in plate, numbered edition, printed on a beautiful heavy weight arches like high quality paper. This print features breathtaking rich colors and an amazing Surrealist composition. Features a wonderful sensuous composition of inspired Love in an explosion of wonderful colors.This elegant striking piece would make a splendid impression and fantastic statement anywhere. This piece is a must have! Own a great art piece at an affordable price. This is your chance to own this excellent art print from one of todays most collectable artists at a exceptionally affordable price. This is a rare Limited Edition size of only 175. Plate SIGNED and Numbered with COA Certificate of Authenticity. 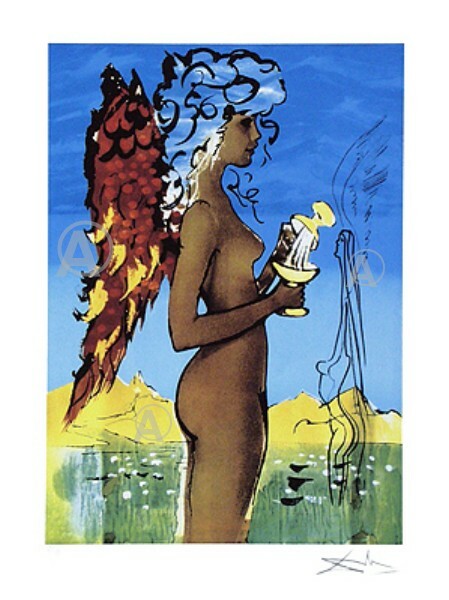 Click the button below to add the Rare Salvador Dali Signed S/n Ltd Ed Surreal Love W/coa to your wish list.